When the English language version of Roberto Benigni’s Pinocchio was released in the U.S. last Christmas, critics scorned it and moviegoers avoided it. One of the biggest problems people had with the movie was with the poor dubbing job. The new two-disc DVD release from Miramax, which has both the Italian and English versions, shows that the critics were right about the dubbing. The Italian version is more watchable, though it ultimately fails to inspire or enchant. 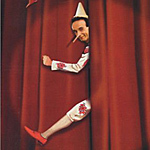 In an interview with the British newspaper, The Guardian, Benigni said that he had wanted to release Pinocchio with subtitles in the United States, but Miramax insisted on dubbing it. The story begins when a log falls out of a cart and crashes into the door of the woodworker, Gepetto (Carlo Giuffrè). After examining the log, Gepetto decides it would make a good puppet. He isn’t even done carving when the puppet starts making impertinent remarks about Gepetto’s wig. As soon as he is finished, Pinocchio — so named because he was made from a pine log — goes on a rampage through the workshop and the town, getting Gepetto in trouble for the damage he has caused. Pinocchio’s naivete and lack of restraint get him into all kinds of trouble. By the end of the movie, he has been robbed, hanged, imprisoned, turned into a donkey and swallowed by a shark. A self-righteous talking cricket (Peppe Barra) tries to give him some moral direction. The Blue Fairy (Nicoletta Braschi, Benigni’s wife and frequent co-star), a loving but disappointed mother figure, also steps in give Pinocchio yet one more chance to be good. Benigni is very good at projecting childlike innocence and naivete. His antics evoke a three-year-old who’s had too much Kool-Aid. Although his performance is entertaining, it’s hard to get over the fact that he’s a middle-aged guy with a receding hairline. Benigni may be young at heart, but his adult stature and five o’clock shadow are distracting. The central message of the story is that kids must learn to behave and to obey their parents or face dire consequences in life. Benigni never conveys the sense that this incorrigible boy is learning and maturing, as a child would. Instead he’s like a drug addict who wants to go straight but can’t stay out of trouble. When it’s time for the plot to wrap up, he simply sees the light and becomes a better person (and a real boy). Still, Pinocchio isn’t a total waste of time. It has some funny moments, like the lollipop-loving judges, and some moving moments, like Pinocchio’s reunion with Gepetto. Also, the elaborate production design by the late Danilo Donati (to whom the movie is dedicated) gives the movie a fairy-tale look without cluttering the frame. The story is darker and less syrupy than the Disney version, and apparently more faithful to Carlo Collodi’s book. The picture is crisp and does justice to the movie’s fairy-tale look and bright color scheme. The sound on both discs is Dolby Digital 5.1. The Italian disc also has English and French soundtracks. It’s easy to see why critics hated the English dubbed version. Although lip movements and voices can never match up perfectly, this dubbed version is particularly disjointed. Hearing distinctive voices (John Cleese and Regis Philbin, for instance) while watching the on-screen actors’ lips move in Italian is especially distracting. And Breckin Meyer, performing the voice of Pinocchio, sounds strained as he tries to match Begnini’s antics. The special features are disappointing. The Italian disc only has three trailers for other Miramax releases. The English disc has the same three trailers and two featurettes. One is a five-minute documentary about Christmas window displays at the toy store FAO Schwartz which were taken from scenes in the movie. While the displays are certainly impressive, I would have rather learned about the production design for the movie. The other featurette is about the English dubbing. It has brief interviews with some of the actors. There’s not much that can be said about doing voiceover work and it wraps up in four minutes. This version of Pinocchio never quite lives up to its potential, and will probably be remembered in this country as a big flop. It isn’t a total failure, however, and fans of the story or of Benigni may find the movie enjoyable – as long as they skip the dubbing.